Besides the natural attractions and marine tourism, Sulawesi is also presents a variety of outdoor activity like rafting. But there is one more attractions, which is actually more extreme than other, that you've never visited before. This tourism site named Batu Dinding Kilo Tiga, which mean the stone wall Km 3, and this is suitable for those who love adrenaline rush while watching the beauty the scenery around the place. Batu Dinding Kilo Tiga is one of the most extreme sites on the island of Sulawesi. This tourist spot is a natural cliff towering about 90 meters. It has unique shape resembles a beam line of the stacked inverted multi-storey. The splendor of this stone wall will be visible only if you see it from a distance. However, you will feel a great admiration when you see it up close. The beam arrangement can come together and arranged in such a way. 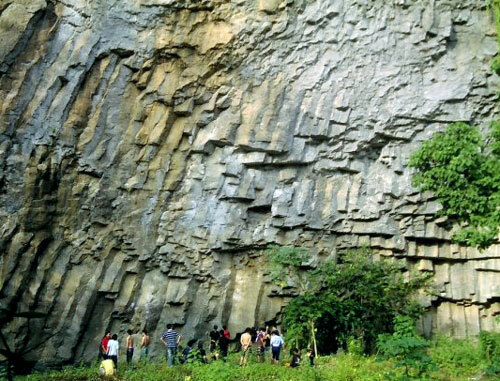 The visitor will surely be amazed with the beauty of the stone that made this cliff. Spider track: this track just like a spider hive, it has long and many difficult tracks. Hang dog track: this is the long hanging track. Tragedy track: this is the track that also becomes the reminder for tragedy that happend when one of the climbers pass away during the flood from Ranoyapo river, near to the cliff. Batu Dinding Kilo Tiga is located in Kilometer 3 village, Amurang sub-district, South Minahasa. To reach this location is can be done from Amurang, which also the capital city from south Minahasa, by using private car for minutes. If you want to use public transportation, we can take it one way and we continue to use Ojek to direct location and take some short walk.